March Madness 2013 is underway with the Round of 64 starting this Thursday. From now until the championship game on April 8, NCAA basketball fans will be on the lookout for game scores and updates. Rise Vision makes it easier for organizations with digital signage to transform their displays into real-time scoreboards to keep viewers posted with the latest scores and news. 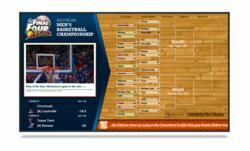 Rise Vision is offering two free digital signage templates that enable users to customize visual displays that show live game scores, brackets, Twitter, and the latest headline news.